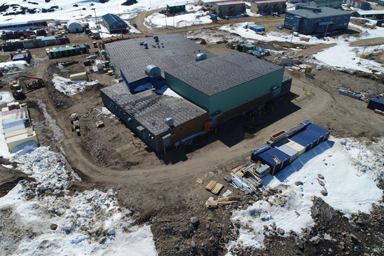 The Design Build Team (“DBT”) of Parkin Architects, Accutech Engineering and Kudlik Construction are quickly approaching the delivery of the High School in Cape Dorset, targeted for the Summer of 2018. This will be the first Design Build school project in the Arctic, delivered 1 year ahead of a typical Arctic construction schedule. The majority of the construction is near completion with building commissioning currently underway. The school will go through a 30 day test to ensure that all Mechanical and Electrical systems are fully functional. The exterior work, which continues to progress, includes the final installation of the roofing, exterior stairs and ramps, along with site civil works. The final interior work includes all architectural finishing along with the furniture, fixtures, and equipment package to be installed in July, when the season’s first shipping vessel arrives. This shipping arrival will mark the final delivery of all outstanding material to site. The DBT is very excited to be delivering the school to this community, following its tragic loss by fire of the previous school in the Fall of 2015.